That’s the question Bronwyn LaMay asked her high school English students to journal about in preparation for reading Toni Morrison’s Song of Solomon. The exercise took longer than expected, with students wanting to use most of the class period to draw from their own personal experiences as well as cultural narratives, literary archetypes, and dictionary entries in order to construct their definitions. Students’ interest in the question was a turning point for LaMay, who has since developed a curriculum around student self-narratives that is based in an approach that supports them bringing their whole selves to the classroom. She details this approach and her students’ narrative journeys in her book Personal Narrative, Revised: Writing Love and Agency in the High School Classroom (2016). Reprinted by permission of the Publisher. From Brownwyn LaMay, Personal Narrative, Revised: Writing Love and Agency in the High School Classroom. New York: Teachers College press. Copyright © 2016 by Teachers College, Columbia University. All rights reserved. Last month, Educator Innovator kicked off a new partnership with Marginal Syllabus, a multi-stakeholder collaboration between Hypothesis, a non-profit organization building an open platform for discussion on the web, Aurora Public Schools in Aurora, CO, and Researchers and teacher educators from the University of Colorado Denver School of Education and Human Development in Denver, CO. We’re excited to announce that we will again partner with Marginal Syllabus for the month of May, along with Bronwyn LaMay, for a week-long “annotathon” of Chapter 5 of Personal Narrative, Revised, titled “Revising Narrative Truth”. LaMay’s book, which began as her dissertation while she was a doctoral student at the Stanford University School of Education, takes up the question of how educators can support full engagement from students whose relationship to education has often been fractured through negative experiences or structural inequalities. For LaMay, full engagement lies at the nexus of the emotional, intellectual, and behavioral, with students bringing their hearts, minds, and attention to work of the classroom and building a healthy relationship with school again–a process that can start with recognizing the personal in the academic and vice versa. When LaMay asked her students to define love, many of them revealed that they had trouble processing love (or a lack thereof) as they witnessed it in familial or romantic relationships, but also in school. By supporting her students to work through these often fraught notions of love and to bring their personal experiences to the texts they were reading in her classroom, LaMay feels she had a hand in building students’ overall sense of agency as learners and members of their communities. Once students had time and space to reflect on their own standpoints and experiences, their understanding of the literature grew deeper—their academic work became sharper. The role of writing here, says LaMay, is critical. When students “write themselves” in the classroom, they can develop a more nuanced understanding of literature, but also of their own identities. 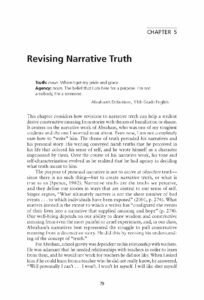 This process of critical reflection can set students on a path toward lifelong learning and strengthen fundamental skills related to narrative writing and beyond. LaMay cites Thomas Newkirk’s work as an inspiration in this regard, as Newkirk argues that narrative is the underlying way we make sense of all genres, including our own lives and selves. We will again use Hypothesis for the annotathon and encourage you to see this blog post from our April collaboration with Marginal Syllabus for full details on how to get started with Hypothesis, view the annotations, and create comments of your own. You can also find out more about why Educator Innovator is supporting this kind of “social reading” and about the Marginal Syllabus project and its commitment to fostering conversations around equity. We look forward to annotating and discussing Bronwyn LaMay’s important work with you this month! Some of the descriptions of Personal Narrative, Revised were taken from a recent NWP Radio interview with Bronwyn LaMay. Listen to the full show here.